Vega is the perfect place to be a first-time water skier! Our very popular program starts with the best Mastercraft competitive ski boats. 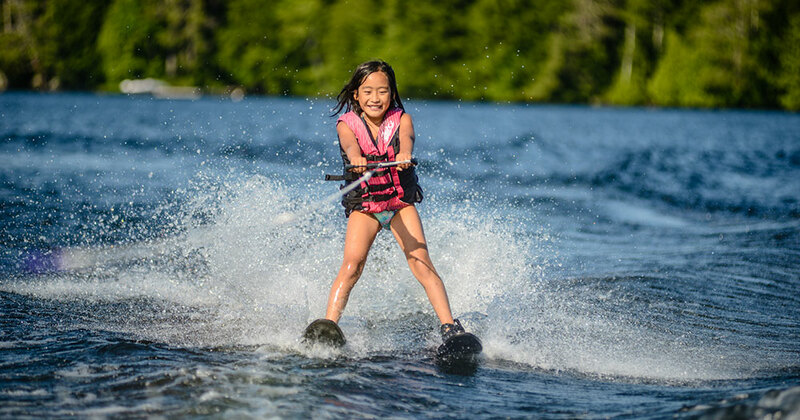 We have four inboard Mastercrafts, including ski booms for helping you get up the first time and insuring that you get the feel of water skiing from the very beginning of the summer. Wakeboarding, slalom, wakesurfing and ski-jumping (for girls 13 and up) are also offered to those who are interested! If you are like most girls, you will want to get better and better, and at Vega we have everything you’ll need to become a very skilled skier. We have two slalom courses and also have a certified ski jump! With our great USA Waterski certified course conductors, and with lots of practice you will have the opportunity to master waterskiing, wakeboarding or wakesurfing every summer.